Argus Heating design and manufacture IBC foil heaters for Intermediate Bulk Containers (IBCs) — a relatively new development in the history of containerised transport. During transportation and storage, many foodstuffs, oils, and chemicals contained in IBCs, cool and become viscous or solidify, making it very difficult to decant the product. Our IBC foil heaters are a cost effective, single-trip solution to this problem, allowing IBCs to be used for most product applications. Argus Heating will custom design an IBC foil heater to meet your specific requirements. Eliminates the need for specialised hot rooms or water baths at the point of decanting. Even distribution of heat across the surface of the heater. Over-temperature circuits for added protection. Optional thermostat or thermocouple available. Output up to 1400W, depending on application. Voltage range 120V, 50Hz (110 - 120V) or 230V, 50 Hz (220 - 240V). Designed and manufactured to be compliant with AS/NZS 60335.2.30:2009. Laminations of craft paper and aluminium foil. Silicone rubber insulated heating cable. Universal IEC plug supplied (other plug options available on request). 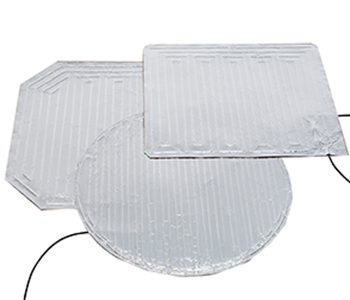 A foil heater provides a cost effective and reliable single-trip solution for heating products in an IBC, providing storage and transport efficiency over alternatives.